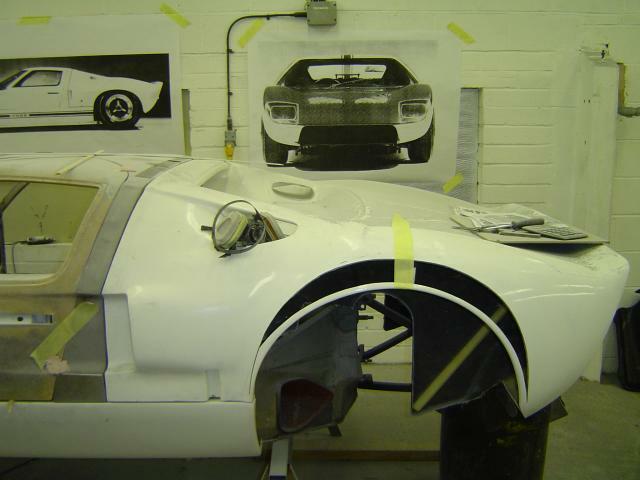 This famous Car was the first of Gelscoe Motorsport’s Prototype restorations. After being sold by FAV when the GT40 went into production, this prototype spent the rest of it’s life in the States. Fitted with the later Nose and Tail section, it competed in several historic races before again being laid to rest in a private Garage. John Etheridge had tracked the Car from day one and after spending years trying to bring the Car back to the UK this went ahead 12mths before it’s planned first race at the Goodwood revival. GT105 was the works test Car and did more development miles than any other GT40 in history. During it’s test program it was shod with the early Nose and Tail shape. One of the problem’s Gelscoe had was to recreate the correct profile Bodywork. 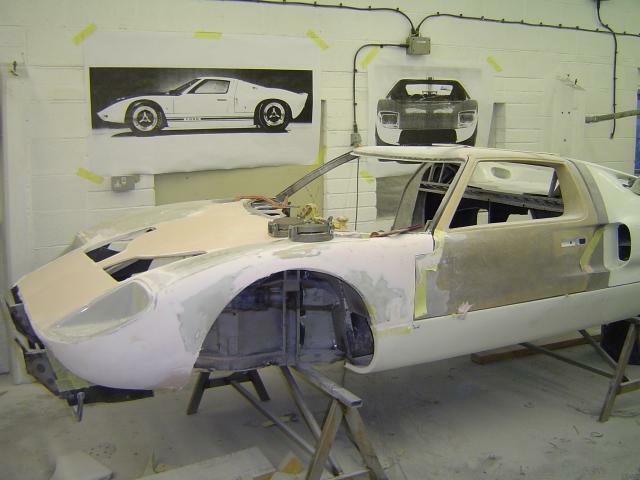 In the photgraph you can see the Chassis being fitted with the period Bodywork and in the background a picture of GT105 from which the scaled measurements were taken. The front Bodywork needed to be corrected to suit the 4″ shorter Nose Frame, along with the Vents which unlike a standard Car cannot be removed. 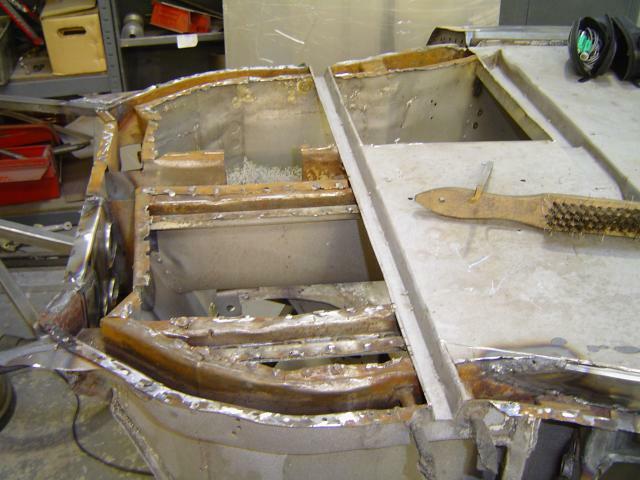 GT105 was in need of comprehensive Chassis restoration. 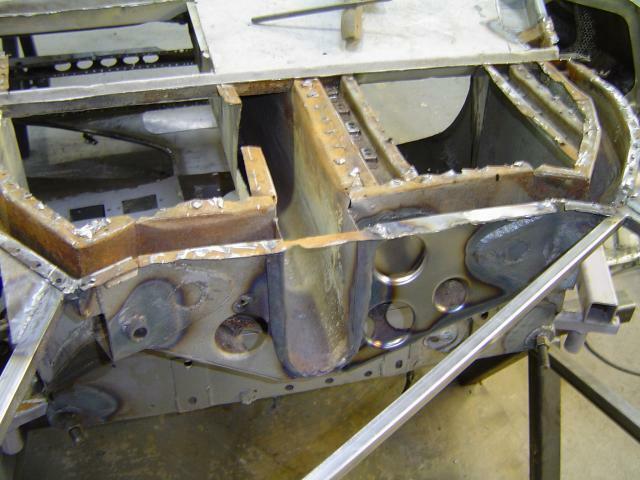 Here you can see the Footwell Panel has been removed to tackle internal rot. Most un-restored GT40s of this age all have this problem to some extent in this area. Being the 1964 test and development Car it was used on a regular basis whatever the weather… not good for an untreated steel Monocoque Chassis !. This entry was posted in Current Builds by Andy Newall. Bookmark the permalink.